Hello @here, thank you to those who came, and those who were in touch about missing it. Today went smoothly, well attended and staffed by volunteers. We had stability in hardware with 6 laptops with support from Mozilla Hive and Free Geek Toronto, and had a take away HTML5 cheat sheet. In other news one of our regular learners attended this session as a volunteer. He helped a first time student learn the ropes with Scratch. @jordanne has ideas about creating handouts to describe the important elements of Scratch, and also, has ideas about Scratch and uses it in fun ways to tell stories. Learn about her cat. Have a really nice day at the @coderdojoto! Thank you to @mozilla Hive and @freegeektoronto for the support in getting 6 quality laptops. @starbucks at King and Dufferin (shoutout to Viv!) for the much needed coffee, and @bitmakerhq for the crucial space, power, and internet. And a most hearty thank you to the students, parents, mentors for showing up to code. Y'all rule. CoderDojos across the world use Scratch as a way to introduce young people to fundamental coding concepts. 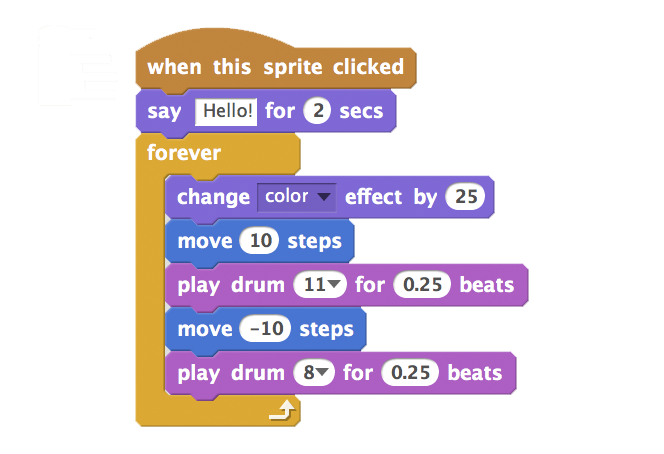 The Scratch team have created AN INTRODUCTORY COMPUTING CURRICULUM USING SCRATCH. It consists of a teaching guide and student workbook. It was developed by members of the ScratchEd research team at the Harvard Graduate School of Education. Computer science and computing-related fields have long been introduced to young people in a way that is disconnected from their interests and values – emphasizing technical detail over creative potential. Creative computing supports the development of personal connections to computing, by drawing upon creativity, imagination, and interests. Many young people with access to computers participate as consumers, rather than designers or creators. Creative computing emphasizes the knowledge, practices, and fundamental literacies that young people need to create the types of dynamic and interactive computational media that they enjoy in their daily lives. Engaging in the creation of computational artifacts prepares young people for more than careers as computer scientists or programmers. It supports young people’s development as computational thinkers – individuals who can draw on computational concepts, practices, and perspectives in all aspects of their lives, across disciplines and contexts.